David Thompson enjoyed a fine junior season at the University of Miami, leading the nation with 90 RBIs and the ACC with 19 home runs. 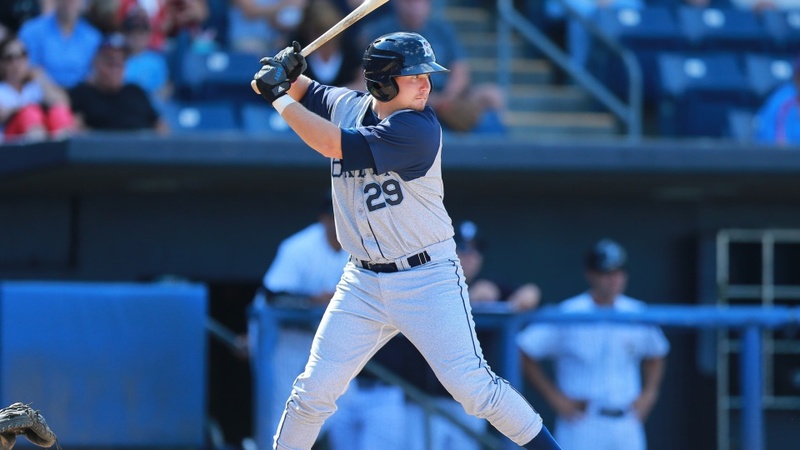 Drafted in the fourth round by the New York Mets, the Brooklyn Cyclones third baseman is getting his first post-college lessons as he encounters some unfamiliar struggles in the game and deals with the daily grind of being a pro. "It's not just a little bit of a grind, it's definitely a big grind," said the New York Mets No. 20 prospect. "It's a long year, especially after the whole college season. I'm just trying to fight through this last month and finish strong." Things started off well enough for Thompson as the Miami momentum carried over to the point where he hit .349 over the first 12 games of his professional career, including a four-hit effort versus Hudson Valley. That four-hit game was followed by an 0-for-21 stretch that snowballed into a .185 batting average over his last 31 games, uncharted territory for a guy who had a .304 career average in three years with the Hurricanes. "I'm just trying to stay positive," said Thompson. "I've never struggled so much in my life as this year -- but just trying to stay positive. We have a lot of good guys on the team, and the coaches are real positive people." In talking to family, friends and former coaches -- those who know him best -- he has been able to remain positive through their kind words and encouragement. And though his last 31 games haven't resulted in a .300 average, Thompson has connected for the first three long balls of his career despite coming to the conclusion that the pitching on this level is top-notch across the board. "The bullpens are a lot better, a lot harder throwers than in college," said Thompson. "Getting more used to facing all good arms, maybe a good starter and then a good closer. You're facing good arms pretty much every at-bat." Between Miami and Brooklyn, Thompson has played in 110 games this year, and though he makes no excuses, there is something to be said about transitioning from college to the pros and how massive the change is for players who have yet to experience everyday life as a professional baseball player. "The whole playing every day is a huge difference," Thompson said. "I'm getting used to that, taking that into next year and also that you have to stay even-keeled in pro ball. In college you had a couple of days to get over a bad game, get humbled by a good game. Now, every day is a new day, and no matter what happened yesterday, you've just got to come to the ballpark with a fresh attitude." Lowell's bombing B's: After Red Sox No. 6 prospect Andrew Benintendi's two-homer day for Lowell on Tuesday, he and teammate Luis Alexander Basabe sat tied for third in the league with seven home runs apiece. The last time two teammates finished in the top three in home runs was in 2012, when Staten Island's Saxon Butler and Peter O'Brien led the league with ten jacks each. Furiously fast: Successful in his last 10 stolen base attempts, including a four-steal game versus Vermont, Batavia's Anfernee Seymour now has 23 swipes and is on pace for 37 stolen bases. Tri-City's Johnny Sewald leads the league with 25 stolen bases and could approach 40 SBs should he continue his pace. No players have eclipsed 30 stolen bases in a season since 2010 when Lowell's Felix Sanchez (38) and Williamsport's Cesar Hernandez (32) both did it. Cleanest closer: Brooklyn closer Alex Palsha has a league-best 11 saves in as many chances. A more impressive stat is that he has yet to yield a run of any kind through 19 2/3 innings, something that hasn't happened in the NYPL in the last decade. Along with a spotless ERA, Palsha has a 0.61 WHIP and 23 strikeouts in 17 appearances for the Cyclones. Within reach: Mitch Gueller, a first-round pick in 2012, has gone 7-1 in nine starts for Williamsport. His win total is tops in the league and gives him an outside chance to become the league's first 10-game winner since Tri-City's Christopher Salamida went 10-1 in 2006. Gueller also leads the league with a 1.84 ERA and is third with a 1.06 WHIP.